If there is a league for blogs with the most number of posts about bundles then Civil Litigation Brief may well be in the top 10 (sadly I suspect even in the top place). There is a reason for this. The bundle for a trial or application is an important document. It is part of the process of advocacy – of persuasion. The judge may know nothing of you, your firm, or your legal credentials. The only thing they have to go on is the quality of the material you put before the court. This is the first impression that the judge will have of the lawyers dealing with the case. You will never get a second chance the make a first impression. If the bundle is chaotic, does not comply with the rules, and follows some (or all) of Sedley’s laws then you are doing your client no service at all. The problem caused by bundles that fail to comply with the rules is exemplified in the judgment today in Venables, Re  EWHC 1037 (Fam). This was a case being heard in the family courts, however many of the issues are universal and apply to all areas of litigation. Relatives of the murdered boy James Bulger were applying to lift or vary an injunction that prevented publication of the details of Jon Venables. The bundle lodged with the court by Mr Makin on 30 April 2018 contained none of these documents. The most significant omission was in relation to paragraph 4.3(c); there was no formulation either of the order being sought by the applicants at the final hearing – how precisely was it being said that the injunction should be varied or discharged? – or of the directions which I was being invited to make. Mr Makin observes that no complaint was made by the other parties as to the form or contents of the bundle. So be it, but so what. “4 I wish to emphasise that the purpose of the Practice Direction is not to make the lives of the judges easier. On the contrary, it is simply a reflection of the increasing burdens being imposed upon judges at all levels in the family justice system who, faced with ever-increasing and almost intolerably overloaded lists, are required – and, I emphasise, willingly agree – to undertake a workload, much of it in their own time, which even their comparatively recent judicial ancestors would have found astonishing. 5 In the more spacious days of my legal youth, judges rarely pre-read very much … the Practice Direction has laid down – and for very good reason I should say – deliberately very prescriptive requirements as to the contents and format of the bundle and … as to the form and content of the ‘preliminary documents’ which are to be included in every bundle. The purpose of all this is to ensure that the judge can embark upon the necessary pre-reading in a structured and focused way, making the best and most efficient use of limited time, so that when the case is actually called on in court everyone can proceed immediately to the heart of the matter, without the need for any substantial opening and with everyone focusing upon the previously identified issues. The objective is to shorten the length of hearings and thereby to increase the ‘throughput’ of the family courts – with the ultimate objective of bringing down waiting times and reducing delay. I do not resile from a word of that: see, more recently, Re L (Procedure: Bundles: Translation)  EWFC 15,  1 FLR 1417. Take careful note of these deadlines. The deadline for lodging trial bundles is contained in CPR 39.5 (2). The claimant must provide the court with the trial bundle not more than 7 days and not less than 3 days before the start of the trial. If the bundle does not reach the court by this deadline a court may reject the bundle or be made the subject of a special costs order. Unless the court orders otherwise, the claimant must file the trial bundle not more than 7 days and not less than 3 days before the start of the trial. The Practice Direction goes on to give other guidance. The originals of the documents contained in the trial bundle, together with copies of any other court orders should be available at the trial. The preparation and production of the trial bundle, even where it is delegated to another person, is the responsibility of the legal representative5 who has conduct of the claim on behalf of the claimant. The trial bundle should be paginated (continuously) throughout, and indexed with a description of each document and the page number. Where the total number of pages is more than 100, numbered dividers should be placed at intervals between groups of documents. The bundle should normally be contained in a ring binder or lever arch file. Where more than one bundle is supplied, they should be clearly distinguishable, for example, by different colours or letters. If there are numerous bundles, a core bundle should be prepared containing the core documents essential to the proceedings, with references to the supplementary documents in the other bundles. For convenience, experts’ reports may be contained in a separate bundle and cross referenced in the main bundle. If a document to be included in the trial bundle is illegible, a typed copy should be included in the bundle next to it, suitably cross-referenced. The party filing the trial bundle should supply identical bundles to all the parties to the proceedings and for the use of the witnesses. It is surprising how many trial bundles do not comply with the basic tenets of the Practice Direction. Many irrelevant documents are included. (For instance there are not many cases where the judge needs to see the Response Pack, every item of correspondence and the claimant’s medical records since birth). It was clearly his extensive experience with trial bundles that led Sedley L.J. to write “Sedley’s Laws of Documents”. These are laws that should be considered, in detail, by every litigator. First Law: Documents may be assembled in any order, provided it is not chronological, numerical or alphabetical. Second Law: Documents shall in no circumstances be paginated continuously. Third Law: No two copies of any bundle shall have the same pagination. Fourth Law: Every document shall carry at least three numbers in different places. Fifth Law: Any important documents shall be omitted. Sixth Law: At least 10 percent of the documents shall appear more than once in the bundle. Seventh Law: As many photocopies as practicable shall be illegible, truncated or cropped. At least 80 percent of the documents shall be irrelevant. Counsel shall refer in court to no more than 10 percent of the documents, but these may include as many irrelevant ones as counsel or solicitor deems appropriate. Ninth Law: Only one side of any double-sided document shall be reproduced. Tenth Law: Transcriptions of manuscript documents shall bear as little relation as reasonably practicable to the original. a staple too short to penetrate the full thickness of the bundle. a ring or arch-binder, so damaged that the two arcs do not meet. WIT AND HUMOUR ARISING OUT OF EXASPERATION? The comments also reveal some controversy as the law (there may be doctrinal differences in years to come). “A note that this account is missing the Eighth law, and (ah, the irony!) the 8th and following in this list are therefore misnumbered. I have observed before that the Chancery Guide is too good to be confined to Chancery Practitioners. It has a useful section on the preparation of bundles in chapter 7. 7.9. 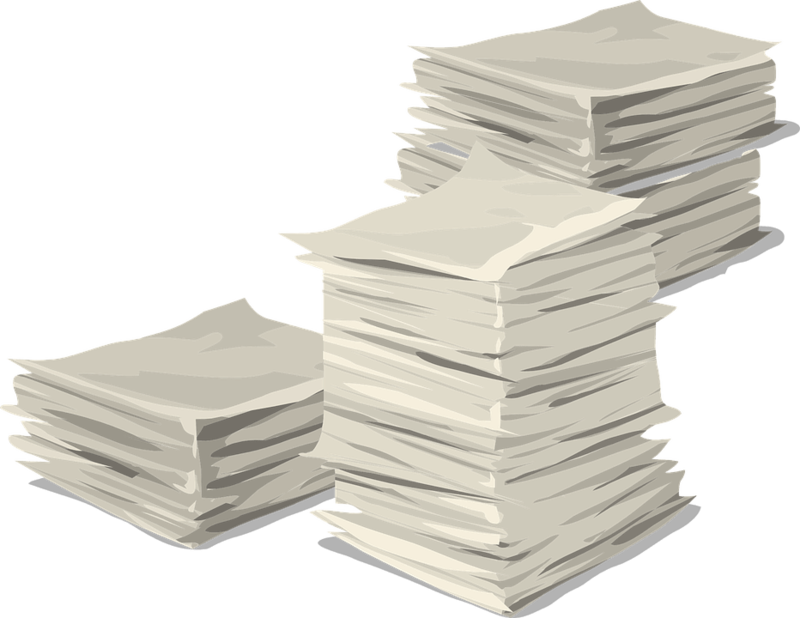 Bundles of documents for use in court will generally be required for all hearings if more than 25 pages are involved (and may be appropriate even if fewer pages are involved). The efficient preparation of bundles of documents is very important. Where bundles have been properly prepared, the case will be easier to understand and present, and time and costs are likely to be saved. Where documents are copied unnecessarily or bundled incompetently the cost may be disallowed. 7.10 Where the provisions of this Guide as to the preparation or delivery of bundles are not followed, the bundle may be rejected by the court or be made the subject of a special costs order. (3) the bundles to be delivered to the court at the required time. 7.12. The representatives for all parties involved must co-operate in agreeing bundles for use in court. The court and the advocates should all have exactly the same bundles. (3) includes agreement that the documents may be treated as evidence of the facts stated in them. The court will normally expect parties to agree that the documents, or at any rate the great majority of them, may be treated as evidence of the facts stated in them. A party not willing to agree should, when the trial bundles are lodged, write a letter to the court (with a copy to all other parties) stating that it is not willing to agree, and explaining why. 7.14. Detailed guidelines on the preparation of bundles are set out in Appendix 6, in addition to those in PD 39A (Miscellaneous Provisions relating to Hearings) paragraph 3. These must always be followed unless there is good reason not to do so. Particular attention is drawn to the need to consider the preparation of a core bundle. 7.15. The general rule is that the claimant/applicant must ensure that one copy of a properly prepared bundle is delivered at the Chancery Judges’ Listing Office not less than three clear days (and not more than seven days) before a trial or application by order. However, the court may direct the delivery of bundles earlier than this. Where oral evidence is to be given an additional copy of the bundle must be available in court for the use of the witnesses. In the case of bundles to be used on judge’s applications (other than applications by order) the bundles must be delivered to the clerk to the Interim Applications judge by 10 am on the morning preceding the day of the hearing unless the court directs otherwise. A bundle delivered to the court should always be in final form and parties should not make a request to alter the bundle after it has been delivered to the court save for good reason. Bundles of documents must comply with paragraph 3 of PD 39A – Miscellaneous Provisions relating to Hearings. These guidelines are additional to those requirements, and they should be followed wherever possible. The preparation of bundles requires co-operation between the legal representatives for all parties, and in many cases a high level of co-operation. It is the duty of all legal representatives to co-operate to the necessary level. Where a party is a litigant in person it is also that party’s duty to co-operate as necessary with the other parties’ legal representatives. Bundles should be prepared in accordance with the following guidance. No more than one copy of any one document should be included, unless there is good reason for doing otherwise. One such reason may be the use of a separate core bundle. If the same document is included in the chronological bundles and is also an exhibit to an affidavit or witness statement, it should be included in the chronological bundle and where it would otherwise appear as an exhibit a sheet should instead be inserted. This sheet should state the page and bundle number in the chronological bundles where the document can be found. Where the court considers that costs have been wasted by copying unnecessary documents, a special costs order may be made against the relevant person. In no circumstances should rival bundles be presented to the court. In general documents should be arranged in date order starting with the earliest document. If a contract or other transactional document is central to the case it may be included in a separate place provided that a page is inserted in the chronological run of documents to indicate where it would have appeared chronologically and where it is to be found instead. Alternatively transactional documents may be placed in a separate bundle as a category. This is covered by paragraph 3 of the PD, but it is permissible, instead of numbering the whole bundle, to number documents separately within tabs. An exception to consecutive page numbering arises in the case of the core bundle. For this it may be preferable to retain the original numbering with each bundle represented by a separate divider. Page numbers should be inserted in bold figures, at the bottom of the page and in a form that can clearly be distinguished from any other pagination on the document. Where possible, the documents should be in A4 format. Where a document has to be read across rather than down the page, it should so be placed in the bundle as to ensure that the top of the text starts nearest the spine. Where any marking or writing in colour on a document is important, for example on a conveyancing plan, the document must be copied in colour or marked up correctly in colour. Documents in manuscript, or not easily legible, should be transcribed; the transcription should be marked and placed adjacent to the document transcribed. Documents in a foreign language should be translated; the translation should be marked and placed adjacent to the document translated; the translation should be agreed or, if it cannot be agreed, each party’s proposed translation should be included. The size of any bundle should be tailored to its contents. There is no point having a large lever-arch file with just a few pages inside. On the other hand bundles should not be overloaded as they tend to break. No bundle should contain more than 300 pages. Binders and files must be strong enough to withstand heavy use. Large documents, such as plans, should be placed in an easily accessible file. If they will need to be opened up often, it may be sensible for the file to be larger than A4 size. Indices should, if possible, be on a single sheet. It is not necessary to waste space with the full heading of the action. Documents should be identified briefly but properly, e.g. “AGS3 – Defendant’s Accounts”. Outer labels should use large and clearly visible lettering, e.g. “A. Pleadings.” The full title of the action and solicitors’ names and addresses should be omitted. A label should be used on the front as well as on the spine. It is important that a label should also be stuck on to the front inside cover of a file, in such a way that it can be clearly seen even when the file is open. All staples, heavy metal clips etc. should be removed. Statements of case should be assembled in ‘chapter’ form, i.e. claim form followed by particulars of claim, followed by further information, irrespective of date. Redundant documents, e.g. particulars of claim overtaken by amendments, requests for further information recited in the answers given, should generally be excluded. Backsheets to statements of case should also be omitted. Backsheets to affidavits and witness statements should be omitted. Before a new document is introduced into bundles which have already been delivered to the court – indeed before it is copied – steps should be taken to ensure that it carries an appropriate bundle/page number, so that it can be added to the court documents. It should not be stapled, and it should be prepared with punch holes for immediate inclusion in the binders in use. If it is expected that a large number of miscellaneous new documents will from time to time be introduced, there should be a special tabbed empty loose-leaf file for that purpose. It is conventional to label this file “X”. An index should be produced for this file, updated as necessary. It is seldom that all inter-solicitor correspondence is required. Only those letters which are likely to be referred to should be copied. They should normally be placed in a separate bundle. Where the volume of documents needed to be included in the bundles, and the nature of the case, makes it sensible, a separate core bundle should be prepared for the trial, containing those documents likely to be referred to most frequently.